JOHN JACOB ASTOR (1763-1848). Astor remains one of the quintessential representations of wealth in America and was the greatest merchant of his time. An immigrant, he began by selling furs and musical instruments, and soon founded the American Fur Company. He invested much of his profits in New York real estate, gaining control of a large portion of Manhattan and building some of its most prominent early buildings. He was the wealthiest individual in America and at his death, his fortune was conservatively estimated at $20,000,000. JOHN JACOB ASTOR (1763-1848) First multi-millionaire in the United States. Astor created the first trust in America, from which he made his fortune in fur trading and real estate. Autograph Letter Signed, “John Jacob Astor.” One page, 7 3/4” x 9 7/8”. No place. August 1834. 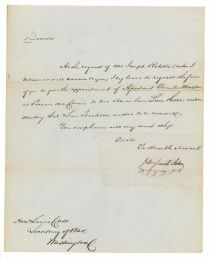 Astor writes to Secretary of War LEWIS CASS (1782-1866) American Military officer and politician, in part: “ At the request of Mr. Joseph Rolette (who I believe is well known to you) I beg leave to request the favor of your to give the appointment of Assistant Quarter Master at Prairie de Chien to his son-in-law Lei. Hooe understanding that Leu. Stockton wishes to be removed … ” Closing and signature removed, as was typical collector behavior during nineteenth century. This closing and signature has been expertly replaced to its original position in the letter. Usual folds. Overall Very Fine. JEAN JOSEPH ROLETTE (1781-1842) was a prominent fur trader and member of the Mackinac Company, which operated a trading post in Prairie due Chien, Wisconsin.